EZdrummer 2 combined with two additional EZX sound libraries, tailored for modern pop production. This bundle combines the world’s most intuitive drum production tool with two (2) additional EZX sound libraries specifically designed for modern pop music production. 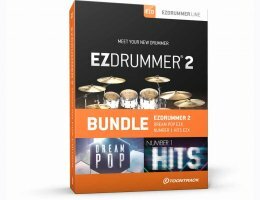 Aside from the five (5) meticulously sampled kits and the comprehensive functionality in EZdrummer 2, the two included EZX libraries Dream Pop EZX and Number 1 Hits EZX come with a wide variety of mix-ready kit presets and sounds. Classic drum machine samples, mixed and mathed hybrid sounds and a broad range of creative percussion elements. This collection is the perfect toolbox for any modern songwriter.